Because his life is already a thrill-and-injury-a-minute trip, Jimmy Fallon is set to get his own ride at Universal Studios Orlando. Fallon announced the park’s latest attraction on The Tonight Show last night, though he wasn’t able to share many details, possibly upon pain of death—or at least another bandaged finger. 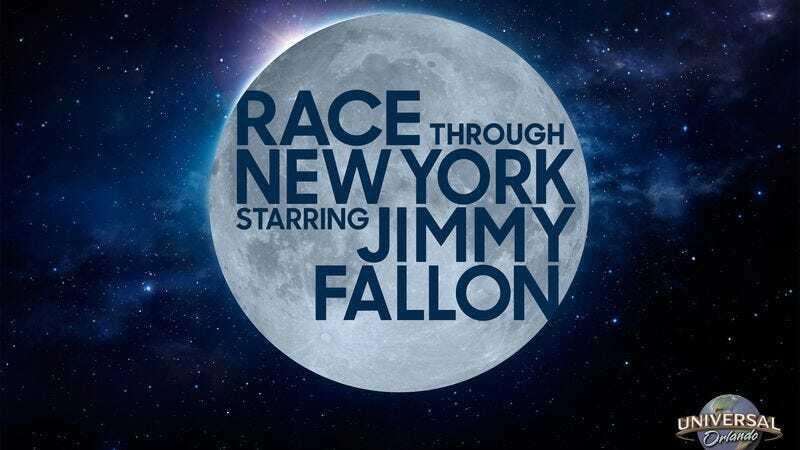 The ride is called “Race Through New York Starring Jimmy Fallon,” and Fallon says it will be like Universal’s Harry Potter attraction, only Hogwarts will be replaced by Madison Square Garden and Hagrid will just be some guy peeing on a subway platform. Okay, so Fallon didn’t make those claims explicitly, but that’s what we’ve taken from the title. But some features we would like to see in this New York-themed ride include overpriced food, long lines, and a sense of superiority over tourists. We’re pretty sure Orlando, Florida can deliver on at least some of those things. The ride will also feature the host and The Roots in some form, and maybe even water (that was one hint Fallon was able to drop before being shushed by a producer). There was also some debate over which dimension the ride would function in, with Fallon noting that “if you really do it right, you can get it up to 8D.” His presumed inability to see things in 3D would explain his propensity for getting hurt, but it was probably just a joke, like having puppies jump on Drew Barrymore and Stephen Moyer. You know, that old gag.